Happy Cat Turquoise, soft leather girls baby shoes in turquoise with happy cat face design. Dino In Navy, Starchild soft leather baby shoes, Dinosaurs on navy shoes. George Giraffe Red, soft leather unisex baby shoes in red with bright yellow giraffe design. Magic Star In Red, Starchild soft leather baby unisex shoes, our own Magic Stars starfish design in yellow on Red shoes. George Giraffe In Blue, boys soft leather baby shoes in blue with bright yellow giraffe design. 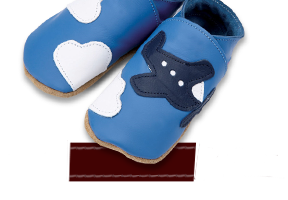 Patch And Bone In Navy, soft leather baby boy shoes in navy with Patch Bulldog and bone design. Princess Paws In Fuchsia, soft leather baby girl shoes in Fuchsia with Princess Paws cat design. Minnie And Cheese In Fuchsia, soft leather baby girl shoes in Fuchsia with Minnie mouse and cheese design. Mousie In Baby Pink, soft leather baby girl shoes in baby pink with Mousie mouse design. Zebra Toggle, unisex baby shoes with hair on cow hide printed in Zebrino style animal print with toggle adjustment. Cow Pink, girls soft leather baby shoes, black and white cow design on pink shoes. King Lion Navy, soft leather baby boy shoes, the king of the jungle, crowned lions face on navy shoes. Kitty Cat In Pink, Soft leather baby girl shoes, white kitty face on pink shoes. Kangaroo On Navy, Starchild soft leather baby boy shoes, brown suede kangaroos on navy leather shoes. Penguin Baby Blue, Soft leather baby shoes, black and white penguin design with yellow beak and feet on baby blue shoes. Hootie Chocolate, Starchild soft leather unisex baby shoes, cute Hootie Owl in green and caramel on chocolate shoes. Hootie Fuchsia, Starchild soft leather baby girl shoes, cute Hootie Owl in candy pink and jade fuchsia shoes. Monkey White, Unisex starchild soft leather baby shoes. Monkey face design on white leather shoes. Daxie White, Starchild soft leather unisex baby shoes. Daxie, daschund sausage dog on white leather shoes. Foxy Chocolate unisex Baby Shoes, Orange and caramel Foxy face on chocolate leather baby shoes.